It’s 2019 and WFA is ringing in the New Year by welcoming two new and talented artists – Ruby Reichardt and Matt Horner. Ruby and Matt’s work will be accompanied by Ilona Sochynsky and our existing winter show. The colorful abstracts juxtaposed with the organic lines of stone sculpture will kick off an exciting year at WFA. Born in the Netherlands, Ruby Reichardt moved to New York in 1984 to begin her journey as an artist. After attending Syracuse University and pursuing an MFA in Illustration and Design, Ruby dedicated herself to her art career. Her prowess does not lie with just one style of art; rather she works in a variety of mediums including acrylic, oil, pastel, and collage. 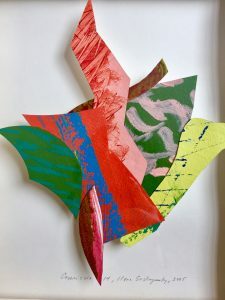 Ruby draws inspiration from the environment coupled with her reflection of the human experience and everything it entails—creation, change, joy, loss, dreams, and the passage of time. Each of her pieces captures a unique story, place, or memory with recurring patterns, textures, colors, and images. WFA is exhibiting her oil on paper works at the gallery. 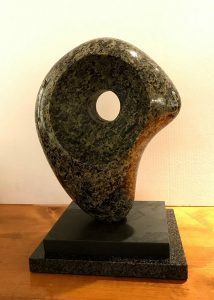 Another newcomer to WFA is Matt Horner, a stone sculptor based out of Keene, NY. This small town nestled high in the peaks of the Adirondack mountains is the perfect source for the locally excavated stones that inspire this native Korean’s artistry. This abundantly mountainous landscape translates directly into his works; organic, flowing curves mimic the rivers and streams that he fly fishes and the earthly palette of the stone harkens back to the larger versions that he scales through his work as a licensed rock and ice climbing guide. Also spicing up the gallery are Ilona Sochynsky’s acrylics on paper. Ilona’s style progresses from hyper-realism to abstraction. Her early paintings depict recognizable single images with shiny, industrial surfaces but over time, she reconstructs her original works as uniquely abstract pieces. Ilona acknowledges the inevitability of reflection as a developing artist, detailing the intense scrutiny and introspection. Her current works of art represent an attempt to analyze the ebb and flow of the creative process with the beauty of trying new textures and paints. Undoubtedly, any viewer of Sochynsky works will be fascinated and mesmerized by her one-of-a-kind models.